Pour all but about 2 tablespoons of the buttermilk around the inside edges of the bowl. Reserve the buttermilk in case it’s needed. Use a sturdy spoon, silicone or rubber spatula, or flexible dough/bench scraper to toss the buttermilk into the butter and flour mixture until a scrappy dough starts to form. If the mixture is still very dry, toss in the remaining buttermilk. Pick up a small amount of the dough and squeeze it in your hand. If it holds together you’re ready to proceed. If most of the mixture is still very dry, you can add buttermilk -1 tablespoon at a time- until the dough holds together when squeezed. Dust a clean work surface with all-purpose flour (NOT self-rising here) and scrape the dough out into a pile. Quickly and gently use just enough pressure to pat the pile of dough into a rectangle that is about 2-inches thick. As you’re patting it out, gently incorporate any crumbling edges back into the dough mass. Slide both hands under one side of the dough (at about 9 o’clock if you think of the dough as a clock face), lift it up, and fold it over the other side at 3 o’clock like you’re closing a book. Again, pat the dough round out into a 2-inch thick rectangle. This time, slide your hands under the bottom of the dough at 6 o’clock and fold it up toward 12 o’clock. Repeat the patting into a 2-inch rectangle, folding from 9 o’clock to 3 o’clock, patting, then folding from 6 o’clock to 12 o’clock. Each time you do this, the dough should hold together just a little better. Rub a rolling pin with flour and very gently roll out the dough into any shape you’d like, but aim for 3/4-inch to 1-inch thickness. Flour a sharp round or square open-topped biscuit or cookie cutter. Cut straight down into the biscuit dough, not turning or spinning the cutter as you cut. 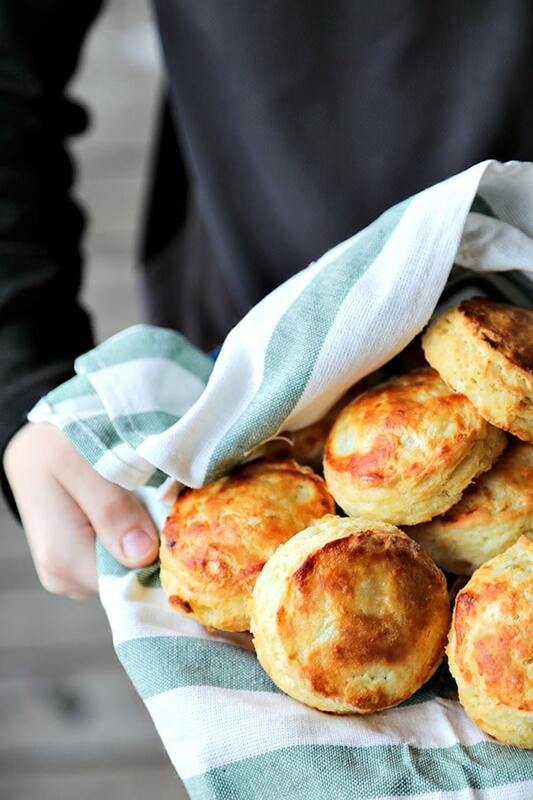 Cut the biscuits as closely together as you possibly can, minimizing any excess between them. If you do not have a sharp biscuit cutter, use a sharp knife and cut straight down into the dough forming squares.